Much of Ching Shih's early life is unknown, including her birth date and her birth name. What we do know is that she was a Cantonese prostitute who was working in the city of Canton until she was captured by pirates. In 1801, she married Zheng Yi, a notorious Cantonese pirate from a successful pirate family. Zheng Yi used military assertion and his reputation to create an alliance of pirates. By 1804, the fleet Zheng Yi created had become one of the most powerful fleets in all of China and was known as the Red Flag Fleet. On November 16, 1807, Zheng Yi died. 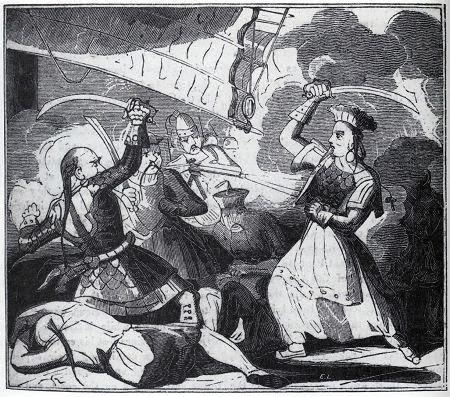 Ching Shih, who had taken part in all of her husband's business as a pirate, began to maneuver herself into her late husbands leadership position. She began to refer to herself as Ching Shih, which means Zheng's widow, and she began to create personal relationships to get rivals to recognize her authority. Ching Shih further strengthened her position by gaining the support of Cheng Pao-yang and Cheng Ch'i, the nephew and cousin of her late husband. Ching Shih used Chang Pao and Cheng Ch'i to manage the fleets daily operations while she commanded the fleet as a whole. Eventually, Chang Pao and Ching Shih became lovers and later on, the two married. Chang Pao and Ching Shih united the Red Flag Fleet under a common code of laws which was strictly enforced. The code included rules on the division of riches taken from captured ships along with punishments for insubordination, and codes on taking captives and raiding villages. By 1806, Ching Shih's fleet was the strongest in all of the Pacific and Indian Oceans. The Chinese attempted to stop the fleet, but failed to do so and lost 63 ships in the process. Portugal and Britain also tried to defeat Ching Shih, but both failed. The navies of the three nations realized that it was hopeless and in 1810, all pirates were offered amnesty. Ching Shih took the opportunity to retire. She took her loot and opened a gambling house. She died in 1844, when it is believed that she was 69. Ching Shih is on our list for creating what was probably the greatest pirate fleet that the world has ever seen.